John Closterman (1660-1711). Artist associated with 58 portraits. Bridges Taylor (1695-1727), Brother of Brook Taylor. Sitter in 1 portrait. Brook Taylor (1685-1731), Mathematician. Sitter in 3 portraits. John Taylor (1687-1703), Brother of Brook Taylor. Sitter in 2 portraits. Margaret Taylor (1683-1738), Sister of Brook Taylor. Sitter in 1 portrait. Mary Taylor (1680-1770), Sister of Brook Taylor. Sitter in 1 portrait. Nathaniel Taylor (1687-1700), Brother of Brook Taylor. Sitter in 1 portrait. Olive Taylor (1681-1757), Sister of Brook Taylor. Sitter in 1 portrait. Upton Taylor (1696-1727), Brother of Brook Taylor. Sitter in 1 portrait. 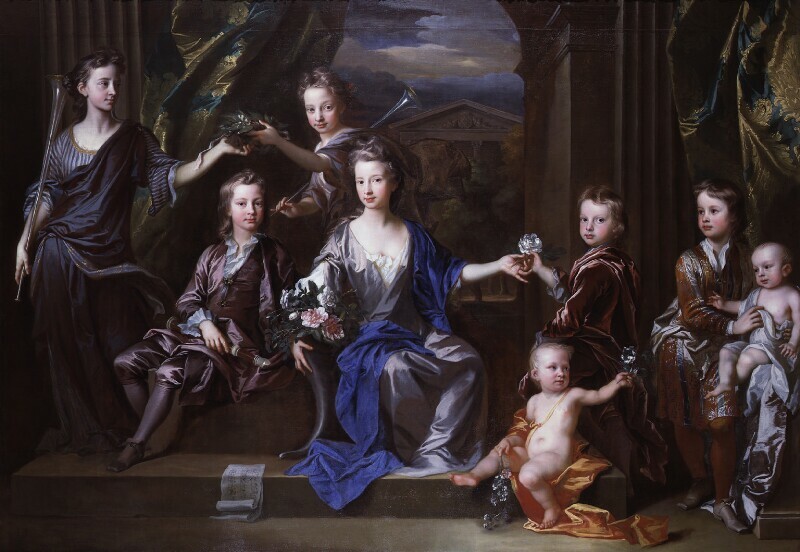 In this great Baroque portrait, the artist has taken the Taylor family's motto 'Fame is sweeter than the white rose' as his organising motif. The oldest child Mary, seated centrally, holding a cornucopia of flowers, extends a white rose to her brother Nathaniel. The toddler below Nathaniel is Bridges; he offers a rose to the youngest child, Upton, who is supported by his brother John. On the left side, Olive and Margaret crown their brother Brook with laurel. Brook, who later became a distinguished mathematician, holds a recorder that symbolises family harmony. HMS Sovereign of the Seas is accidentally destroyed by fire at Chatham. Window Duty, based upon the number of windows in a house, is levied by Parliament to support William III's war with France. The Great Recoinage attempts to replace coins in circulation made up of hammered silver. Recently ordained, Jonathan Swift writes his first book, A Tale of a Tub, which includes an allegory of three brothers representing the principal divisions of Western Christianity. Architect and playwright, John Vanbrugh's hugely successful comedy, The Relapse, is staged at the Drury Lane Theatre. After several years of secret negotiations forged by William III with Louis XIV, king of France, to end the Nine Years' War, envoys from both sides unofficially begin serious talks. Economic depression in Holland leads to riots in Amsterdam.